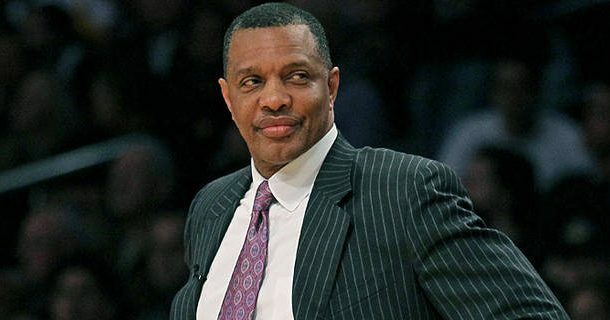 Now that the New Orleans Pelicans have confirmed that head coach Alvin Gentry and general manager Dell Demps will be back with the team next season, some of the uncertainty around next season fades away. Yes, Jrue Holiday may or may not be back with the team next season, and there is still the manner of selling DeMarcus Cousins on resigning. But with the signing of Chris Finch from the Denver Nuggets, and Gentry’s comments over the past weeks, the plan to revamp the offense is very clear. Finch may not be a well-known name to casual NBA fans, but he is very highly regarded in NBA circles. On Monday’s Locked on Pelicans podcast, Adam Mares of Locked on Nuggets joined me to shed some light on what Finch accomplished in Denver. Give it a listen and then read on! The offball cuts and movement also helps create for others. Whether Jokic is on the three-point line or free throw line initiating the offense, defenders often have to sag off shooters in the corners to play help defense and take away a cut and score opportunity. At that point it doesn’t even take a fancy pass to generate a good shot opportunity. Just get the ball easily to the open man. Pretty much anything Jokic can do, Cousins can do as well. Boogie may not be on the same level as Jokic as a passer, but the Pelicans’ big man has the ability to keep the ball moving, and is a willing passer. With Holiday still a question mark, and Robert Pack, who spent the majority of his time working with the Pelicans’ guards, gone, it’s not hard to see the shift in focus from a traditional point guard initiated offense to one revolving around the team’s two dominant bigmen. This also has the added benefit of lessening the blow should Holiday sign with another team. Rather than reinvent the offense mid-season after the trade, Gentry stuck with what the majority of the team knew. It did work to varying degrees, but no one will argue that playing in transition is the most effective way to build an offense around Anthony Davis and DeMarcus Cousins. Now the Pelicans offense will hope (and hope is the key word here, and something I will come back to in a moment) to take a leap to another level. Imagine both Davis and Cousins in the paint with a high-low action. Davis cuts towards the perimeter and sets a screen to free up another cutter who Cousins passes to for the easy assist. Or Cousins on the perimeter with Davis and Solomon Hill setting screens at the free throw line for an Elevator Doors-like set for a three-point shooter. Dribble handoffs turning into give and goes. I could go on and on. If you’re anti-Gentry all of this is welcome news. The biggest concern has been Gentry wanting to force his fast, transition style of play onto a team focused around two bigs. At least the head coach is showing signs of being willing to adapt. And if it fails then Gentry supporters will likely have no reason to defend him. While everything Gentry says, and the hiring of Chris Finch, sounds great on paper there is still a lot of reasons to think this won’t work. All of the off ball movement and cutting takes players who are willing to do the work, have the work ethic, energy, and hustle, as well as the basketball IQ to time the cut properly. Those aren’t exactly words and phrases used to describe the team. Don’t forget the Pelicans preached movement last season, but the offense was still incredibly stagnant. We can talk all we want about how great the Pelicans offense can be, but it doesn’t matter if the players don’t go out and execute it. A huge priority for Gentry and Finch will be to get the team’s buy-in early on. The other issue is shooting. And this cannot be overstated enough. The Pelicans will get lots of open perimeter looks next season, but they still will struggle to score points if those shots do not fall. Gentry also said as much, “We are going to have to upgrade there and the players that we have are going to have to show vast improvement over the summer.” Denver surged to the 5th best offense last season in no small part to ranking 11th in three-point shooting. This helps shine a light on what the Pelicans offseason priorities will be: signing cheap shooters in free agency. Overall, the Pelicans have a plan that makes sense whether Jrue Holiday resigns or not. But it still comes down to Alvin Gentry and Dell Demps. Demps needs to sign the right players to fill out the roster, and Gentry needs to get them to actually play as a team. If they don’t it looks like next offseason will have much more uncertainty.